The charms of the Mississippi Great River Road are often subtle – instead of clamoring for your attention, these River towns often seem to wait for you to settle in and be quiet a bit. Then, in their own time and in their own way, they begin to lead you somewhere or tell you a story. I know nothing about Burlington, Iowa, except that a few people have mentioned Snake Alley. I don’t quite get what that is, so I start there. 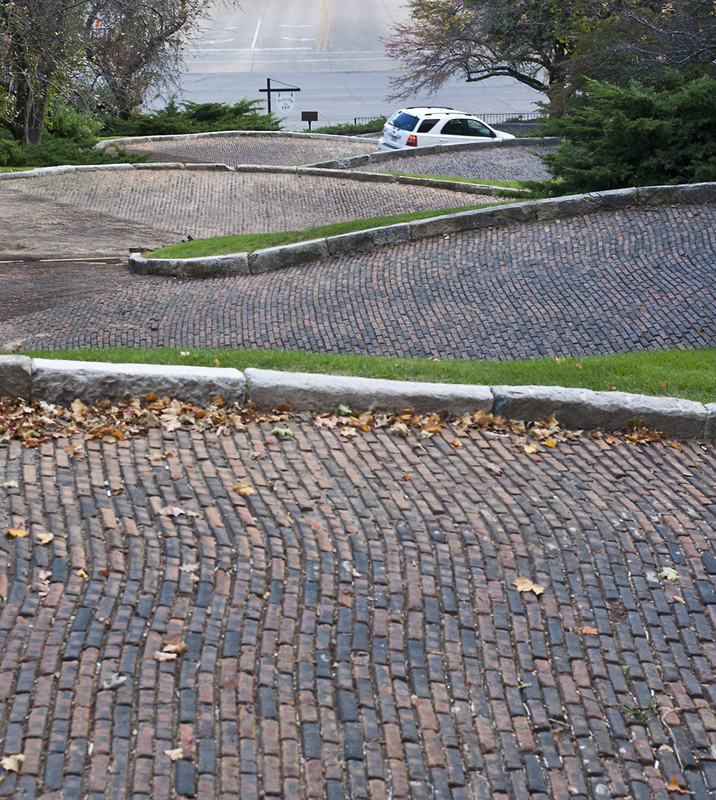 It turns out to be a brick street, reminiscent of San Francisco’s Lombard Street, that squiggles its way down a very steep hill. It was built in 1894 to provide more secure footing for horses negotiating the hill during Iowa’s snowy winters. It did that, it seems, at least on the downhill trek, but after enough horses and riders took a tumble on the way up, the city fathers declared that it would become a one-way street and so it remains today. As I’m getting my shots, there is a friendly “Good morning,” from a woman out walking her dog. In the unguarded, interested way of so many Iowans, she wants to know where I come from and what I am up to, so we stand on the sidewalk chatting. I’ve come on the perfect day, she tells me, to sample the German culture of the region and I absolutely must go to the Oktoberfest on the River. 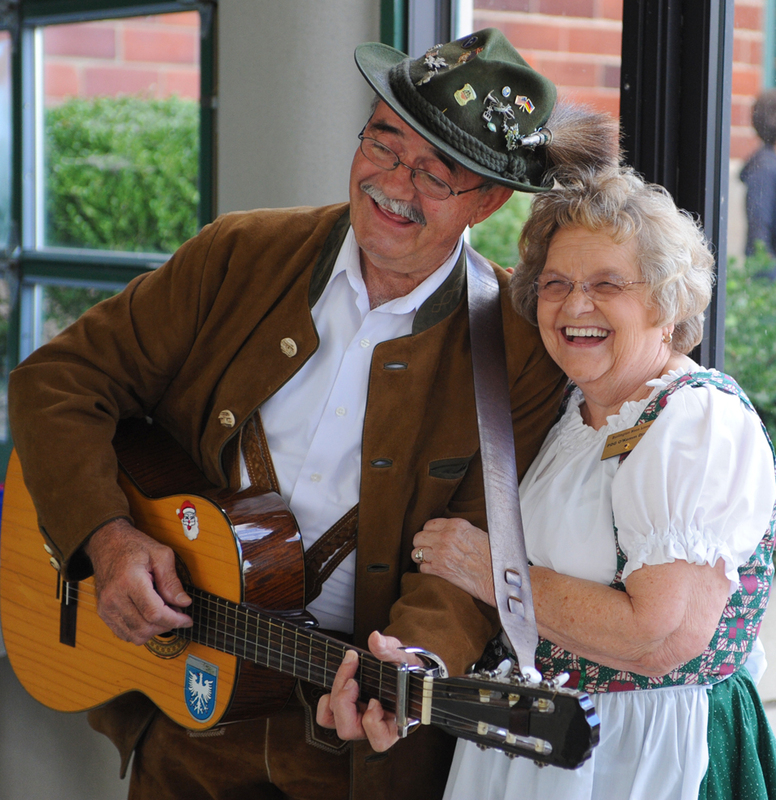 There will be a Polka band and dancing, German potato salad, brats, sauerkraut and plenty of beer. Now, truth be told, I’m not very fond of brats or sauerkraut (I think it helps to grow up with those things), but I love being where people are having fun, so I wouldn’t miss it. Its early afternoon when I arrive, but the beer is flowing and the band is playing. People recognize me as being “not from here” and several immediately offer beer, food and conversation, so I join a table of revelers. 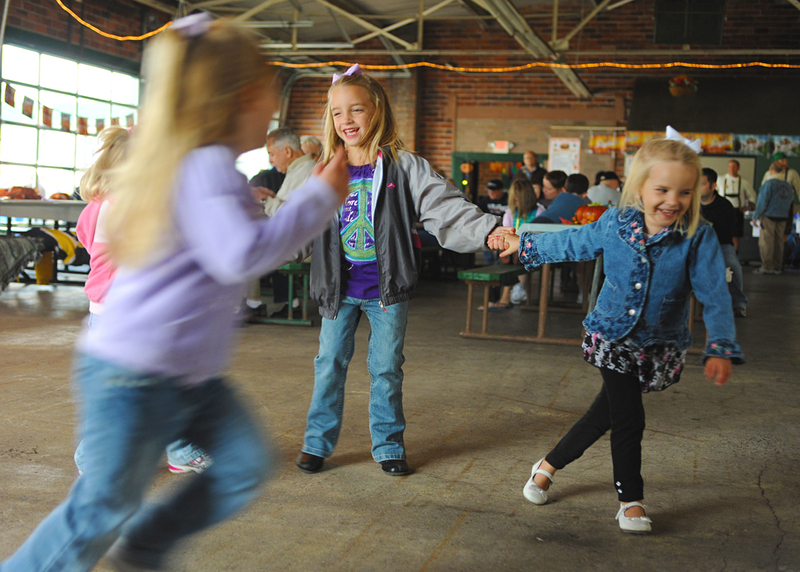 There aren’t many grown-up dancers yet, so the floor is the domain of blonde, porcelain-skinned little girls twirling, stomping and giggling with full-out abandon. 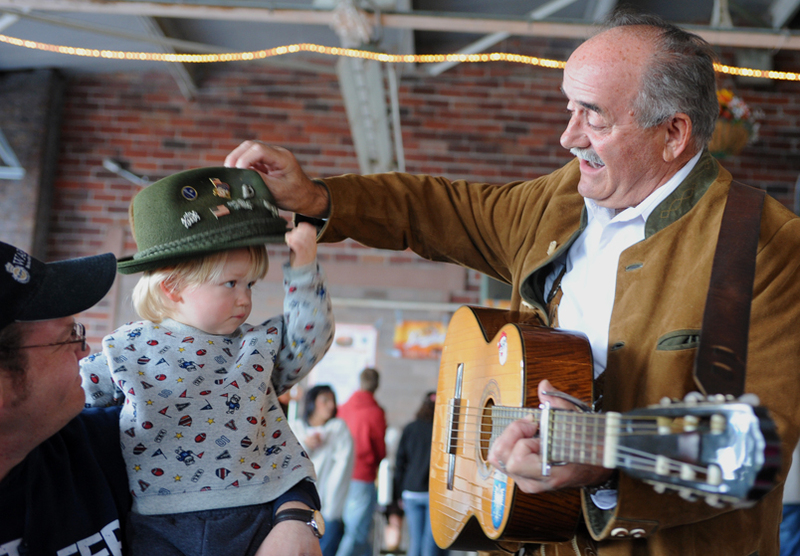 A strolling, lederhosen-clad musician dubbed, “The Happy Bavarian” is teasing people and playing with the little ones. He sings and plays his way into the food service area where he disrupts it all by flirting with the help. Peals of laughter follow him. The band downshifts and starts a slow, melodic ballad. 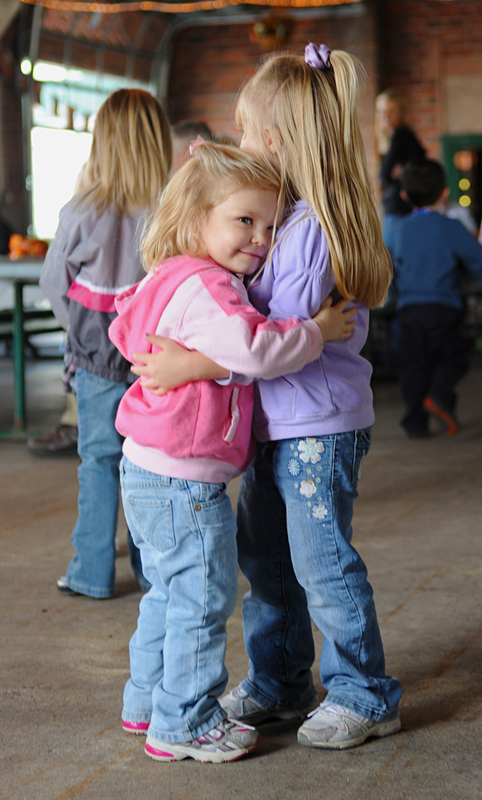 The girls on the dance floor snuggle close to one another, smiling serenely and swaying back and forth, much to the delight of their audience. I hurry out to photograph them and when I look up, I see tables full of beaming faces, everyone smiling as though they are the proud parents. Much is said about separation, loneliness and alienation prevailing in today’s society. Here, surrounded by music and hearty laughter, watching innocence on the dance floor and warm openness everywhere, I wish that this moment could be shared with all who need it. P.S. – Lots of new folks are joining the “raindrop journey” – welcome! If you haven’t done it yet, I hope you’ll sign up to be notified when new posts go up! There’s a box on every page where you can enter your email or sign up via RSS. Thanks for traveling with us! Beautifully done. Makes me smile. You are so welcome! It makes me very happy to think that it did that for you! well….ummm….no But I am married to a guy who grew up in Wisconsin, so believe me – over the years, I have given them their fair chance with me! 🙂 Thanks for traveling with us!! Beautiful! So proud to call Burlington my hometown. Thanks, Joanie – and Welcome! Please come back —you’ve only seen one event here. Believe there are many more. I can recommmend Steamboat Days which is the week in June that ends on Father’s Day each year—major acts all week from Tuesday through Saturday nights for a total cost for the week of $55; food vendors, carnival rides and thousands of people in lawn chairs and standing –enjoyinf the music, friends you haven’t seen since last Steamboat Days, the Mississippi River and the starlit night. Then on Sunday, Father’s Day, you can enjoy the Snake Alley Art Fair——-3 blocks of artisans in their booths up Snake Alley’s curves and for two blocks beyond that. It’s a tradition to stroll up and down the street and alley each year, shopping, greeting friends, buying art or jewelry, scupture, and many amazing things. There’s also our art deco style Capitol Theater, re-opened a year ago, and the really neat events it brings in. There’s HeritageFest in September all along Jefferson Street downtown. There’s the Living Windows event in early December, where everyone comes downtown to walk along Jefferson, admiring the living events going on in the store windows, sipping hot chocolate, taking horse-drawn trolley rides and wishing neighborsw merry christmas. 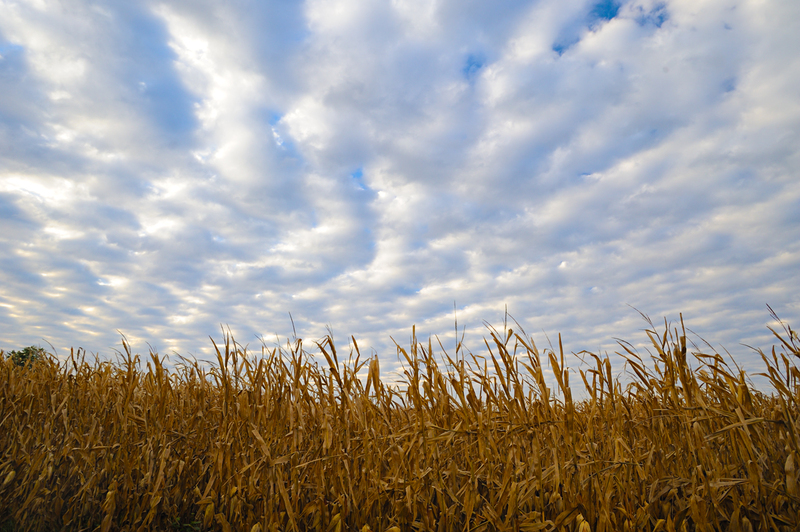 If you come back, you will enjoy this event and more of the Iowa friendliness, guaranteed. Wow! You do know how to have fun there! 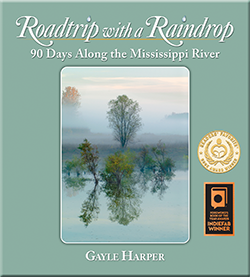 Actually, once the book is off to be printed, I’ll be creating a slide show and then I plan to revisit as many of the river towns as possible. I’d love to come to Burlington again – and maybe even time it to coincide with one of your events! Thanks for all that great info! Another beautifully written and photographed stop on your journey. Thanks for sharing! Thank you so much, Annette! The Mississippi is lined with so many awesome people and fascinating places, I could happily do this trip again many times over!! I love coming along with you, Gayle. Thanks for this adventure! Thanks, Sandy – I love having you travel with us! !